Fancy Flat Diamond Chain Cutting Machine is a programmable logic controlled (PLC) and pneumatically operating chain faceting machine. Fancy Flat Diamond Chain Cutting Machine gives designers freedom to design chains in a variety of patterns, as they want. 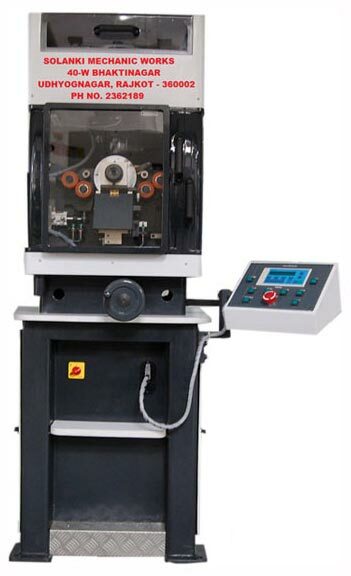 Certain attributes such as longer service life, efficient performance with minimum efforts and low operating cost are attributes that make our Fancy Flat Diamond Chain Cutting Machine worth investing. The programmable logic controlled (PLC) fancy diamond faceting machine can generate decoration on various flat and rectangular chains in steps and alternative intervals. The machine is pneumatically operated for long term trouble free production. The machine is equipped with programmable logic controller. Stored designs can be selected as desired thus giving flexibility in production and is user friendly. The special adjustable horizontal head gives flexibility in generating designs on narrow and wide chains ensuring distorting free machning. All the machine components are machined in precision CNC machine and are hardened and grounded. These components are individually inspected for accuracies. This machine is assembled in a controlled environment.